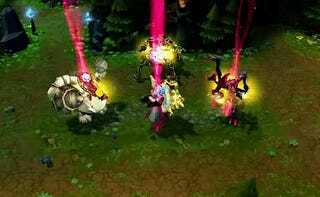 Riot's April Fools' joke for League of Legends was to implement a temporary new mode called URF, or Ultra-Rapid Fire. It's essentially a mode where the balance of the game is thrown out the window, with players able to cast explosive spells whenever the hell they wanted. Cooldowns are dramatically reduced, there are no spell costs, ranged units get twice the attack speed, it's a free-for-all. And people love it. So much so that, as The Daily Dot reports, there are now fans clamouring for Riot to keep the game mode available (it's scheduled to be removed at the end of the week). It'd never be useful in competition, of course, but why not let fans have a little fun now and again, blow off some steam?